Educational Development - Houston Metropolitan Alumnae Chapter of Delta Sigma Theta Sorority, Inc.
Delta’s investment in developing the minds of our future are evident through the Dr. Betty Shabazz Delta Academy, a leadership and empowerment program for girls ages 11-14 years; the Dr. Jeanne L. Noble Delta GEMS (Growing and Empowering Myself Successfully) program which fostering the dreams of girls ages 14-18 years; and the EMBODI (Empowering Males to Build Opportunities for Developing Independence) youth program for males ages 11-18 years, which uses, for example, the hallmarks of STEM education, leadership, college readiness, fiscal management, civic engagement and service learning to impact our participant’s lives. HMAC’s educational development mission is to mentor youth participants through monthly workshops and activities that foster a safe, developmental, fun and educational environment, where interactions are with other young teens. The Delta Academy and EMBODI programs are STEM-based and the Delta GEMS program takes an entrepreneurial leadership approach and will provide mentors who are educators, creative thinkers and business leaders who are highly experienced in their various industries. HMAC’s Signature youth education event, the annual PACE Conference, is held every December. The Conference was designed to encourage the youth in our community to PACE (Prepare, Achieve, Create and Educate) themselves for a future where they can not only challenge, but change thoughts and attitudes toward today’s social and cultural norms. Lending the young ladies the tools to help cultivate and maintain interpersonal relationships with female adults. Academy sessions include components on sisterhood, scholarship, and literacy. The Academy sessions are conducted by non-traditional career professionals and educators who share their personal area of expertise and encourage the young ladies to dream bigger dreams. Sample activities include particpating in HMAC's P.A.C.E. (Prepare, Achieve, Create, Educate) Conference, our annual Black History Program and Awareness Workshops, STEM Robotics camp, an Etiquette workshop, and our First Impressions Luncheon which is our closing banquet which celebrates the many accomplishments of the participants throughout the year.. In addition to the regularly scheduled meetings, participants have the opportunity to give back to the local community through a learning activity (e.g. HIVE, Houston Area Food Bank). The Academy sessions are held October through May of each year. As with all of our youth programs, Academy participants, just as our volunteers and mentors, are asked to commit to attend approximately six monthly meetings. Participants must also embrace the Academy’s principles, and adhere to the Academy’s Code of Conduct. 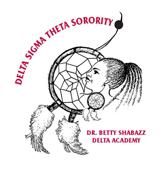 Delta GEMS, a national signature program of Delta Sigma Theta Sorority, Inc., is community based program created to inspire young women and help them to actualize their dreams. 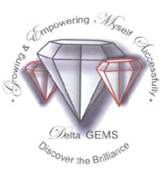 Delta GEMS provides a positive network for teenage girls ages 14-18 to strengthen and develop their will to achieve. By encouraging a “CAN DO” attitude, Delta GEMS strives to “catch the dreams” of at-risk, adolescent girls. The purpose of Delta GEMS program is to form a road map for college and career planning which incorporates five major components: Scholarship, Sisterhood, Show Me the Money, Service and Infinitely Complete. Each component provides opportunities for self-growth and enables young ladies to function intellectually, responsibly and socially in today’s society. To instill the need to excel academically. To provide tools that enable girls to sharpen and enhance their skills to achieve high levels of academic success. To assist girls in proper goal setting and planning for their futures – high school and beyond. Applicants must be female students who reside in the Houston area, enrolled in high school grades 9-12 (ages 14-18) and must have a sincere interest and willingness to participate in activities provided by the Delta GEMS program. Click Here to fill out the online Google Doc registration form. The online registration must be submitted electronically by Sunday, September 30, 2018. Registrants will be contacted after this date. The parent and student orientation will take place on Saturday, October 20, 2018 from 10:00 am - 12 noon at Westbury High School located at 11911 Chimney Rock Rd, Houston, TX 77035. It is mandatory for parents/guardians to attend the parent and student orientation. Risk management forms must be submitted at the parent/student orientation in September. EMBODI is designed to refocus on the plight of African-American males to enable them to reach their fullest potential educationally, socially and emotionally. EMBODI is designed to address these issues through dialogue and recommendations for change and action. The delivery options may include a town hall meeting, workshops and/or teen leadership summits. The HMAC EMBODI program services African American males between the ages of 11 and 14 (i.e., middle school) residing in the Houston area. This year the HMAC EMBODI program will add a Science, Technology, Engineering, and Math (STEM) component. The EMBODI sessions are held October through May of each year. As with all of our youth programs, EMBODI participants, just as our volunteers and mentors, are asked to commit to attend approximately six monthly meetings. Participants must also embrace the EMBODI’s principles, and adhere to the EMBODI's Code of Conduct. Houston Metropolitan Alumane Chapter’s (HMAC) Scholarship Program has been in existence since the chapter‘s inception. HMAC awards scholarships to high school students in Houston graduating from a school within our service area. In the first year, HMAC awarded a book scholarship valued at $500.00. Since the first year, through the dedicated efforts of the Chapter, the type and amount awarded to deserving students has significantly increased every year. The Chapter has awarded over $700,000 in scholarships to over 200 area high school students. Scholarships have been awarded to graduating seniors who have demonstrated a significant level of academic success, social awareness, and community involvement, as they pursue a goal of higher education. Applicants must live in the Houston area or attend a school in our service area.The Scholarship Committee evaluates candidates based on community service, academic achievement, a personal statement, a written essay, an interview and letters of recommendation, and financial need based on information provided with the application. Community Service is the essential component of the award. All applicants must plan to enroll full-time in an accredited two or four-year college/university in the summer or in the year of the award. HMAC provides payment of all scholarship money, on behalf of the recipient, directly to the college or university where the recipient is enrolled. HMAC scholarship awards may only be used to pay tuition, room and board, and fees. Students may apply for the HMAC scholarship, even if they have applied for or received scholarship awards from any other source, including other chapters of Delta Sigma Theta Sorority, Inc. The scholarship will only be granted for the academic year that it is awarded. To submit an application, you may download an Application, complete it, and mail it along with all of the necessary documentation (essay, personal statement, letters of recommendation, photo, and official transcript) to the address provided on the application. All applications are due by April 1st of each award year. Please forward any inquiries regarding our Educational Development Programs to youth@hmacdelta.org.